I'm beyond excited to announce that registration for my upcoming Los Angeles workshop is now open to the public! As many of you know, I've worked with the ladies of Sugar Paper quite frequently in the past and they've been gracious enough to open up their headquarters to host this intensive, two day calligraphy and lettering workshop! Their space is ridiculously gorgeous and I know that everyone who attends will appreciate their attention to detail and fabulous style. 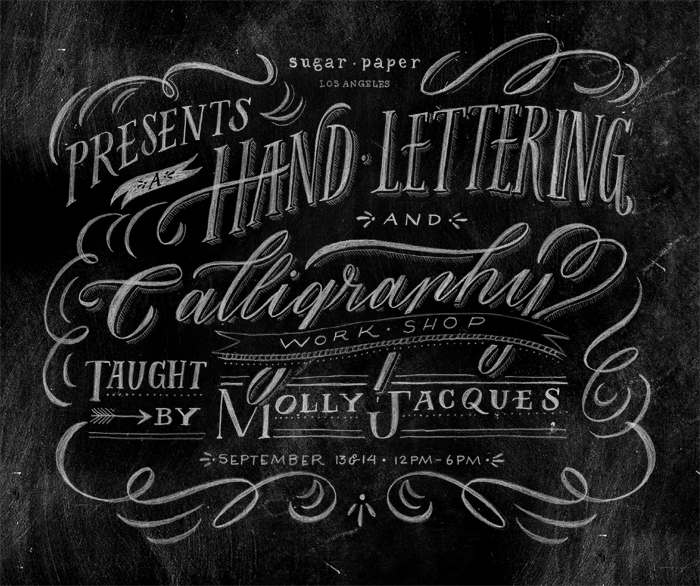 This workshop is taking things up a notch, teaching both Calligraphy & Hand Lettering. It's going to be a two-day intensive workshop where I'll be teaching you the basics of calligraphy & lettering (there's a difference between the two!) as well as advanced tutorials on manipulating your hand lettering in photoshop, creating vector lettering, and mixing custom ink colors. Remember, spots are limited so be sure to sign up to reserve your place in the class asap! Looking forward to seeing you all there!